Thursday after work, Lauren and I hopped aboard a small plane and flew to Buffalo, NY for the start of an extended weekend trip to the Niagara Falls area for the much-anticipated Sniekers-Stranges wedding. That of course refers to Lauren’s old sorority friend Daphne Sniekers and her new husband Salvatore Stranges. Lauren was to be a reader at the wedding ceremony, and I was there for moral support. First of all, let me tell you how excited I was to be going to a wedding without having to DJ, or having some other role, for the first time in 47 weddings dating back to December 2007 at the infamous Berglund-Huseby matrimony celebration. My role here was to show up, eat a ton of food, drink a bunch of booze, and get sweaty on the dance floor. We arrived at the Buffalo Niagara International Airport around 10:00pm and, for the first time in either of our lives, rented a car! Hertz was the cheapest, surprisingly, and we departed in our shiny new 2010 Chevy Impala in the dark through Upstate New York before hitting the Canada border. Normally, according to Lauren, it’s a quick greeting and you’re passed through, but with the G-20 Summit going on in Toronto, we were interrogated by the Border Patrol. I was already a little nervous that I wouldn’t be allowed entry into Canada. We had to go so far as to prove we were going to a wedding, and had to show our invitation which I luckily happened to bring along. We were granted entry and continued on into the Niagara Falls region. After checking into the Courtyard Marriott, we went out for a late night drink to celebrate our safe arrival. Surprisingly, not much was open in the touristy downtown area except for a Boston Pizza, so we sat on the patio and ordered up a couple drinks—I went the very girly route and ordered a Bellini, a puree of peaches and sangria and apparently a splash of rum, though in my defense I thought I was ordering something completely different. Lauren never let me hear the end of that one as she manned up and ordered a Molson Canadian beer on tap. The city of Niagara Falls reminded me of another touristy town I visited for a wedding in 1997—Gatlinburg, Tennessee. Anytime a Ripley’s Believe It or Not museum is found downtown, you know you’re in a tourist trap where locals seek to squeeze as much money out of you as possible. Anytime someone takes your picture against a green screen and hands you a number to get your picture printed, you know you’re in a tourist trap. So we did our best to avoid that area. In the morning, we found it difficult to get out of bed. The bed at the Courtyard was ridiculously comfortable. We both agreed it was the best bed we’d ever slept on (must find out the manufacturer and model)! The room also included a spacious whirlpool tub, perfect for a soak before climbing into bed. After a fairly bland breakfast, we walked over to the actual Niagara Falls waterfalls and took a ride on the Maid of the Mist boat, which took us right up next to the falls. Despite the rain ponchos they handed out to everyone, I got very wet. That was pretty cool though… for $14.50 it was money well-spent. Here’s a very brief video I filmed of the tour. After that, we wandered around a casino and blew through a $20 bill in record time. In the afternoon, we ventured over to one of the many wineries in the area and sampled six kinds of wine. We intended to do a whole tour of the vineyards but we were tight on time as Lauren needed to be at wedding rehearsal. 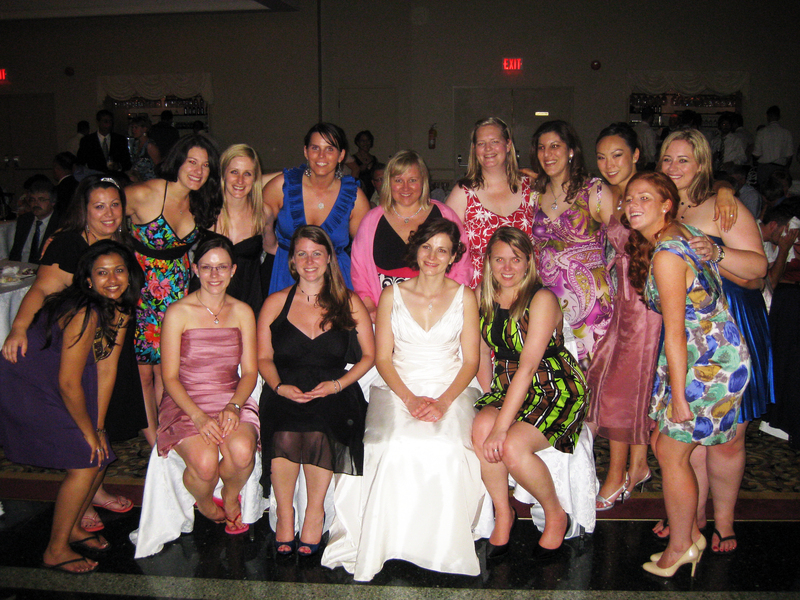 The rehearsal was a chance for me to meet many of Lauren’s university—not college—friends for the first time, and see some of them again who were at our wedding. A rehearsal dinner buffet filled me to the brim. The next day, Lauren got all dolled up and went to meet up with the wedding party for pictures around town on a limo bus. I checked out of the hotel and had a few hours to kill, so I headed over to a casino. Unfortunately, I couldn’t remember by ING card PIN number and was locked out of my account altogether, leaving me with no money. But I eventually broke down and sat at a bar watching televised darts and paid with my credit card, which I vowed not to use except in emergencies until it is paid off. The wedding ceremony was an unusual one, with a bitterly cranky priest who announced the “exchanging of wows” and often seemed to forget Sal and Daphne’s names. But it was a fine ceremony and there were a few lighthearted moments, including placing a ring on the wrong hand and ring bearers tearing up and down the aisle. Lauren’s reading went off without a hitch. I was very moved by her attention to enunciation. The reception was a 57-kilometer drive north to Stoney Creek, and it was quite different than any other reception I’ve been to. It appeared Lauren and I were the only Americans in attendance. While both families live in Canada, Daphne had many relatives from Belgium present, and Sal had many Italians. Perhaps it is European tradition, but the amounts of food served was unreal. It was a five-course meal that spanned five hours, not to mention the appetizers and late night buffet on both ends. There was salad, entree, entree, entree, dessert, plus there were white-gloved waiters walking around offering seconds of any of the courses. It was a shockingly large amount of food, which made it all the more difficult to get a buzz going at the open bar! But as soon as the dance began (after 11pm!) the alcohol began to take effect. 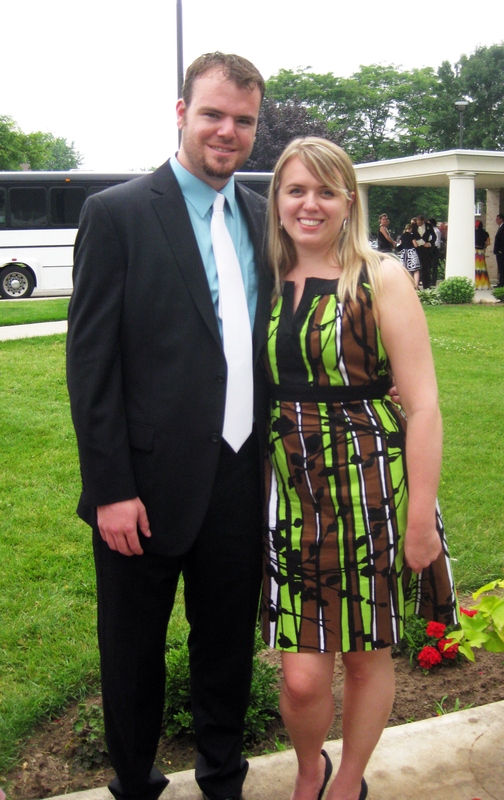 I was going to make darn sure that I got tipsy at this rare occasion where I was free to enjoy myself at a wedding. I like to think my dance moves were among the best on display, and my shirt was completely soaked after just a few minutes of dancing. Lauren and I were invited to ride with the couple back to their hotel for the after party. I didn’t last long and went to bed by 3, but Lauren and her friends had a dance party in someone’s room till the wee hours of the morn. Sunday we slept late and drove back to Buffalo, where we killed some time by poking around town and eating lunch at the Anchor Bar, famous for its owner being the inventor of the Buffalo wings in the sixties. The wings may have been the first ever, but they were no better or worse than any other wing I’ve eaten. Just a novelty type of deal. We sat around the airport for a long time and made it home by 8pm. The only snag was I lost by Park-N-Fly ticket, which created a long backup as I tried to leave the parking lot. Overall, excellent trip! Check back later as I plan to post all the photos on Facebook. Here are a few for now. Oh man, I could have given you a ride and saved you 80 bucks on your parking! Will take you up on that next time! It was only $34, but still. 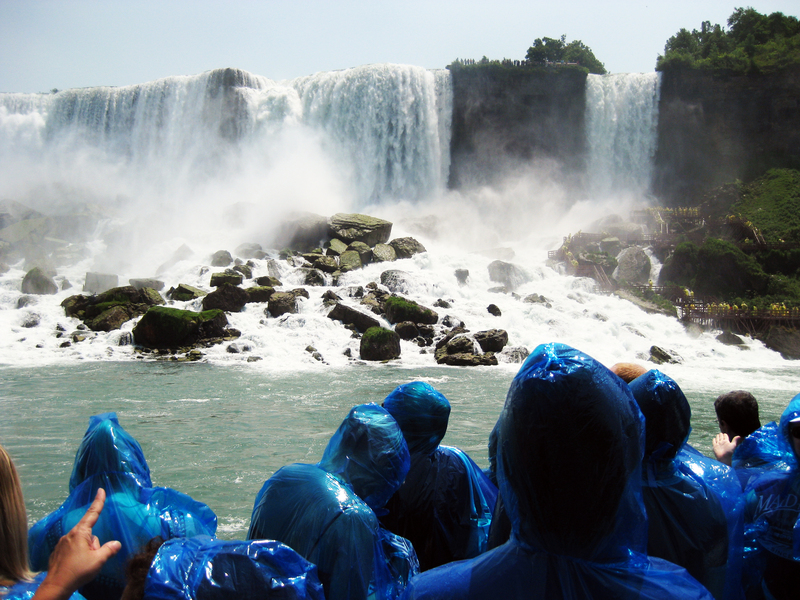 Sounds like you both had a good time…did you try going over the falls in a barrel? Jason would have.